MOMS, DADS, TEACHERS, STUDENTS, KIDDOS, EVERYONE!!! Do you like to color? This is probably nothing new BUT…I thought I would point a few things out that I’ve researched and more importantly learned over the years being an art teacher. They will ditch the device for a while. Screen addiction is a real thing. Lets be honest, who is addicted to their screen as an adult? Just think what kids are going to experience in a world where EVERYTHING is online and accessible. Promotes focus and concentration. In a world where stimulation is everywhere. It’s nice to promote a more relaxed state of mind. Can improve handwriting. They are tasked with staying in the lines. This focused manipulation of the medium (the crayon or colored pencil) is a skill. Gives them confidence. Especially when you showcase their work, ask them questions, and praise them. Having a little art gallery at home is a great way to showcase artwork. Check out my Pinterest board for some display ideas. More accepting of criticism and guidance. When they make mistakes, help them learn how to improve. Show them. Ditching the device! < As I mentioned in the kid’s column, we all need to unplug for a while. It can reduce stress because you’re putting your mind in a meditative state focusing on the present act of coloring. Making marks on your paper, choosing colors, and experimenting with techniques. It travels well. Take your project to the beach, to a coffee shop, wherever you want really. You can color WITH your kids!! You can fill some empty wall space with your masterpieces or repurpose them in creative ways. Look HERE. 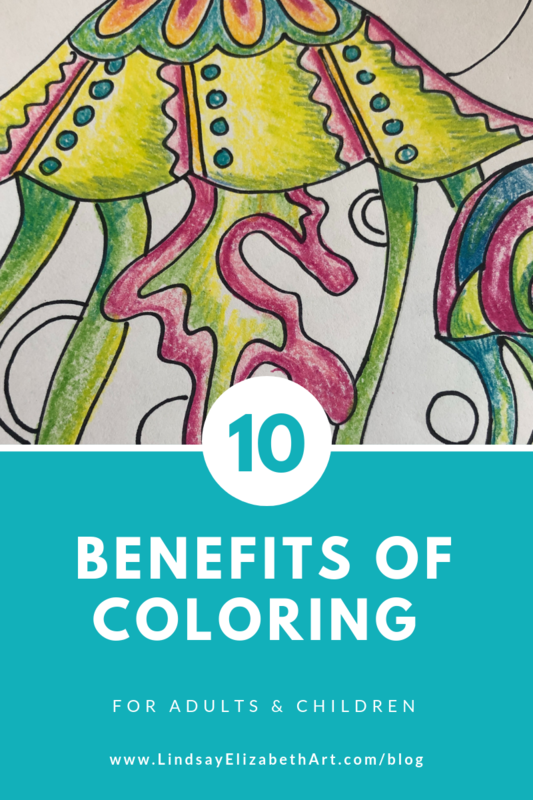 Did I convince you that coloring is beneficial? If so, embark on a coloring journey WITH ME! Here is some information about my latest ebook. It’s A COLORING BOOK! An online community #ColorwaterStudio to share your work, see the work of others, and learn more about the benefits of coloring. Active links to further explore supplies, color palettes, techniques, and DIY projects. You have 24 hours to download your copy of this ebook. ***For personal use only. If intended as a gift, please only gift this ebook once. After that, please share it via this product link so your friends and loved ones can support my small business just as you did. So how does this work again?? What the heck is Colorwater Studio? Why does she keep talking about this? LOL. I can’t keep up. Let me break it down…Colorwater Studio is my virtual studio. I talked about it a bit in a previous post. I will be posting tutorials, visuals, inspiration, links to other artists, and much more RIGHT HERE IN MY BLOG. If you purchased one of my ebooks (Watercolor Projects or the Jellyfish Coloring Book (AVAILABLE MARCH 1) you will learn from these posts and apply what you’ve learned to the ebook projects. Make sense? If it doesn’t, click here so we can chat. It’s basically a place for me provide information in real time without having to create a 367 page ebook. :) Because I can talk about this stuff all day! Although the information provided by Colorwater Studio will be closely related to the projects in my ebooks, you can certainly learn from and enjoy it without having purchased either. HAPPY MAKING! … and don’t forge to use #ColorwaterStudio and tag me in your work @LindsayElizabethArt. Only 8 more days until my coloring book releases! Get on my email list recieve a special discount code! !